For more than two thousand years Christian proselytizing was couched in terms of "defending the faith." Until recently much of that defense came in the form of reactions against the "liberal" influences channeled through big-corporate media such as popular music, movies, and television. But the election of Ronald Reagan as a Hollywood President introduced Christian America to the tools of advertising and multimedia appeals to win new believers.Christotainmentexamines how Christian fundamentalism has realigned its armies to employ the forces it once considered its chief enemies: the entertainment media, including movies, television, music, theme parks, video games, and books. Invited contributors discuss the top-selling devices within Christian pop culture and the appeal to masses of American souls through the blessed marriage of corporatism and the quest for pleasure. 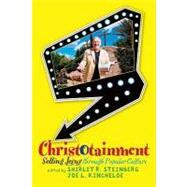 Shirley R. Steinberg Joe L. Kincheloe is professor of urban education at the CUNY Graduate Center and Brooklyn College. He is the author of more than 30 books and hundreds of articles. His most recent works include Critical Pedagogy: A Primer, and The Sign of the Burger: McDonald's and the Culture of Power. Kincheloe and Shirley Steinberg have recently finished 19 Urban Questions: Teaching in the City.